With Diogo Morgado, Amber Rose Revah, Sebastian Knapp, Greg Hicks, Darwin Shaw. Written by Richard Bedser, Christopher Spencer, Colin Swash, Nic Young. Directed by Christopher Spencer. Rated PG-13 for intense and bloody depiction of The Crucifixion, and for some sequences of violence. 138 minutes. According to Islamic tradition, the Prophet Mohammad may not be depicted, period. This is why in the 1977 film “Mohammad, Messenger of God” never shows him or most of his family, and the central character played by Anthony Quinn is the prophet’s uncle. If only Christianity had a similar tradition, we might be spared many bad movie depictions of Jesus. Instead, we get SON OF GOD, which was edited from the History Channel’s miniseries “The Bible,” which tells the story of Jesus as depicted in the Christian Bible. What it amounts to is a clunky retelling of the New Testament’s greatest hits, as we wait for the key miracles and lines from the arrival of the Magi to the “doubting” of the apostle Thomas. It’s hard to imagine this appealing to anyone except devout Christians and/or lovers of cheesy Bible epics, because as a narrative, it is not very good. Jesus is played by Portuguese actor Diogo Morgado as a cult leader. He demands belief and faith of his followers, but–per the text–offers little in the way of explanation. If one accepts him as the Messiah, then one simply follows. If one does not, it gets a bit creepy. It’s difficult to review the acting. Biblical epics tend either to be all-star productions (as in the ludicrous “The Greatest Story Ever Told”) or, as here, populated by unknowns. Greg Hicks gives the film’s campiest performance as Roman governor Pontius Pilate, looking as if he began every scene by sucking on a lemon. It’s often hard to tell the apostles apart, while the Jewish leaders seem to be an ahistorical mix of Pharisees (the rabbis who were independent of the temple), the Sadducees (the temple priesthood which at that point was largely controlled by the Roman conquerors), and a military force under the control of the High Priest. The film maintains the New Testament’s propaganda against the Pharisees. When the Gospels were written a couple of centuries after the events they purport to depict, the Sadducees (and the Temple) were gone, and so the Pharisees were the rivals of the leaders of the competing faith. That one has to get into such historical and theological issues says more about the film’s agenda than anything else. As with Mel Gibson’s “The Passion Of The Christ,” the Jews are clearly the ones guilty for Jesus’s death, even depicting the high priest Caiaphas threatening Pilate that Caesar will blame him if Jesus remains loose and stirring up trouble. For Christians, this is part of their Biblical text with which they must grapple and either reinterpret or else bear the responsibility for the centuries of Christian attacks on Jews. That the Anti-Defamation League’s Abraham Foxman has reportedly given this film his blessing indicates that his announced retirement next year can’t come soon enough. It’s a move about the bible, how else should it be interpreted. This review is silly. Talk about the movie, actors, directing, but to try to make the movie politically correct in some kind of defeatist way is disingenuous. Sorry, your review fails, can you write one as if it was just any movie instead of criticizing the gospels? No, it’s a movie about the Christian Bible. People should be aware that it repeats the historical inaccuracies of that text. Further, I made it clear that it was an edited down version of a television miniseries, and that the acting was terrible. You may disagree with the review, but it hardly “fails” simply because it doesn’t reflect your own views. Pretty sure it was actually 40-60 years after the events that the gospels were written by the eye witnesses of these events. Diago plays a cult leader? No bias in this review at. Open your mind and review the movie as a movie next time. At the very least leave out your prejudice. Interesting. Pointing out the prejudice in the movie makes the person doing so prejudiced. Really? “there’s no way to tell the story of Jesus on film that will please everyone” … This is the most significant statement in the review. Other critics are praising the film for NOT delving into historical controversy, whereas this review adopts the most liberal viewpoints (“the Gospels were written a couple of centuries after the events,” which no major scholar agrees with…except for minor editing they were written DECADES later) and condemns the film for not adhering to them. I’m not a Christian, either, but I want to know why the film does not stand up as a film; I honestly couldn’t care less why a particular reviewer disagreed with its premise. I certainly don’t look to a movie review for a history lesson. That’s what blogs are for. The reviews seem mostly negative. And it’s not a matter of “liberal” versus “conservative.” Thanks for being honest about your agenda. Yes, my agenda reading a movie review is to read a review of the movie. I’m funny like that. And just because a review is negative doesn’t mean there are no positives to find in it. Regardless, you are avoiding my point that YOUR review takes a heavy liberal viewpoint (one that no reputable scholar holds, not even Burton L. Mack, who barely acknowledges that Jesus even existed) and holds it against the movie. In other words, you are not judging the movie solely on what the movie is but on what you think it should have been. 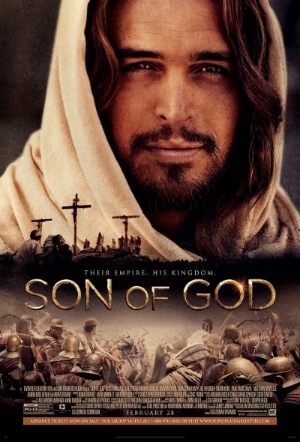 Son of God is a movie that aims and purports to be a dramatized version of the Bible (it’s even taken from a television series bearing that name). If this is a critical review, then it should review the film on its own merits, based on its own ambitions; if this is a blog post, then fine, but it should not appear on Rotten Tomatoes. It was a decent review overall. It is inevitable that ones beliefs would play a part on reviewing a movie like this. I was simply implying the tone of your review at certain points suggest personal bias took over at times. Such as your opinion on the new testament. I would try to leave sections like that out. Focus down on the movie itself more so. Wether you saw prejudice in the movie is your opinion and I will leave you to it. This is just what I see in this review. Take it or leave it. It was not a matter of personal bias. It was a matter of the distortions in the source material being repeated on film. Pretending they aren’t there would be an example of bias. I think the review makes it pretty clear that it’s an inartfully made movie, and that for those whom this is a matter of sincere religious belief, they may choose to ignore the movie’s flaws. The ot you mean? Part of the same book(christian bible. Ot + nt = the cb). You clearly believe otherwise which I will respect. The “Old Testament” is the Christian understanding of the traditional Jewish “TaNaKh,” albeit with the books in a different order and with interpretations totally at variance with Jewish thought.